Water, is indispensable for agriculture. However, only 15% of agricultural land, the world over, gets dependable water supply. In India too, only a fraction of cultivated land gets a dependable supply of water. Various irrigation methods are employed by farmers to ensure proper water-supply. Canal irrigation is one such method. However, canals occupy cultivable space and thus hamper production. Moreover, nearly 40% of canal water is wasted due to evaporation and percolation. Besides, in certain areas, canal irrigation over a period of time has led to salination. Pipes are an effective way of overcoming the problem caused by canal irrigation as they can be laid under ground and moreover, water loss due to percolation and evaporation is eliminated. Lift irrigation is employed to draw water from a lower to a higher level. Here, various kinds of pipes are used. GETECH RIGID PVC PIPES with their good quality, trouble free service, durability and economical use are a better choice than mild steel, galvanized steel, cast iron, and plastic pipes. Economy: Being cheaper than conventional cement and steel pipes, Rigid PVC PIPES are very economical. Light Weight: PVC pipes are 1/6th the weight of steel pipes. This makes them easy to carry and install, doing away with heavy material handling equipment. This reduces labour cost as well, as the process of installation is faster. Rugged and Durable: Manufactured out of the best PVC material, Rigid PVC PIPES do not get rusted and are not affected by most chemicals. Hence, they last longer, Render, trouble - free service and require less maintenance. More Flow: Frictional losses in RIGID PVC PIPES are 40% lower than conventional pipes. Hence there is approximately 25% more flow than from pipes of the same size conventional pipes and pipes of other companies. A contour survey is undertaken to know the topography of the area of land to be irrigated. Based on this survey, the delivery chamber could be conveniently located at the highest point and the rest of the land could be irrigated by canals. Next, the route of the pipe line from the source of water to the delivery chamber should be finalized. While finalizing the pipe route, due consideration should be given to the strata of earth, so that excavation cost can be kept at the minimum and the most economical length be decided. A longitudinal section is plotted after finalizing this data. This L section denotes the length and static head of the pipe line. (ref. sketch). While the survey is in progress, the cropping pattern should be decided. Availability of water, (whether perennial or for eight months only) and types of crops in Rabi and Kharif seasons, are the factors to be taken into consideration. Adequate thought given to these factors will ensure better utilization of the pump-set and pipe line and also eliminating the danger of drying up of crops. iv) Time for operation of pump - 'T' hours. Once all the above are known one should establish the discharge required in each season. The pump set and pipe should be able to handle the maximum discharge of all seasons. From the above example, it is clear that the maximum discharge required is in summer and the pump set to be selected should have discharge capacity of 2.5 ltr/sec at adequate hed. Depending on the height to which water is to be lifted, the class or pressure rating pipe is decided. Static head, frictional and other losses should be taken into consideration. In order to calculate this, frictional losses in pipe, fittings and valves are to be added on to static head. Frictional losses in pipe of a particular diameter could be found out from charts enclosed. Length of pipe line -500 mtrs. Selecting 63 mm x 4kg. pipe, the frictional losses are 18.75 mtrs/km fro 2.5 l.p.s. flow (from chart) therefore the frictional losses. Therefore it is safe to use 63 mm 4 kg. Pipes. Calculate H.P. for 2.55 l.p.s. discharge to be lifted to a total height of 40 mtrs., with centrifugal pump set. The pipes are very useful for lift irrigation, where water in the lower level are pumped to the higher level, where from the precious waters are brought to the needed point by means of pipes, without any loss of water, at any stage. Trenching- Trench should be of adequate width and depth. Depth should be such that it provides clean cushion of 75 to 100cms. Width should be equal to dia = 30 mm. After excavation , the trenches should be inspected and sharp objects like stones, tins or nails should be removed. If the bottom is rocky, it should be covered with soft soil or sand to a depth of 10o cms. Even otherwise, the trench bed should be soft and flat. The pipes with one end duly fitted with the socket should then be laid in the trench, then the pipes should be jointed by solvent cement jointing process. Anchor blocks are to be incorporated whenever the pipe line changes direction, so that pipe line sustains water hammer. The testing should be undertaken in stages of about 1000 mtrs. To 1500 mtrs. However any convenient length could be selected. Benefits of selecting a shorter length is that the faults, if any, could be detected easily. The tested pipe line could be then conveniently buried if found okay. Steps in testing are as under. Keep all air vents open so that trapped air, if any, can escape. For the past about three decades, Sujala Pipes (P) Ltd., Nandyal has been manufacturing uPVC Electrical Conduits under the brand names Nandi, Nandi Premium, Nandi Deluxe, Nandi Gold, Nandi Platinum and Nandi Diamond using latest technologies to geep pace with the modern technology and the choice of the customers. The company believes in total Quality control measures and as a part of it each pipe is thoroughly checked at the manufacturing stage, so as to ensure that the customer is supplied with good quality product. The company's Electrical Conduits are of ISI Standards and used for domestic & industrial purposes, the pipe size ranging from 16mm to 63mm to outer diameter. Easy installation: The Conduit are light in weight and are simple & easy to install. Easy Wiring : These conduit have high mechanical strength in that it is assisted by smooth interior wall that reduces friction thus helping in easy wiring. These pipes can be used for installation both in open and concealed way. These conduits have built in strength ensuring long life. uPVC Electrical Conduits are supplied in Polythene bags. ASTM Pipes are produced strictly as per ASTM D 1785 and they offer the following advantage over conventional pipes like cement and cast iron pipes. These pipes are priced at affordable rates. Rust and leak proof and have high resistance to heat, fire etc. Better resistance of water hammer and surge pressure. Maintenance free and ensure high flow rate. Also usable in Offices, Hotels, Complexes and Building for water connection, distribution and sanitary purposes. Sujala Pipes Pvt Ltd., Nandyala, a unit of Nandi Group of companies, has been manufacturing 'uPVC' brand Unplasticized Polyvinyl Chloride (u PVC) plain and Socket end pipes with nominal outside diameter from 75, 90, 110 & 160 mm. 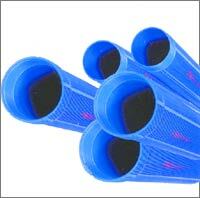 These pipes are used in soil and waste discharge system inside the buildings including ventilating and rain water applications. The pipe's surface colour is dark shade of gray. Pipes are made and supplied in nomial lengths of 4, 6, 8 and 10 feet either plain or with solvent typed socket / '0' ring typed grooved socket. The company's uPVC gold brand SWR pipe enjoys ISI recognition. (IS: 13592 - 1992). The Company also manufacturers SWR pipes under the brand names of uPVC premium and uPVC Deluxe as per customer's choice and requirements. These pipes are manufactured with virgin material only. Type A: For use in ventilation pipe work and rain water applications. Type B: For use in soil and waster discharge systems. High flow rate & Non - Conductive - uPVC pipes have smooth inner surface. uPVC SWR Pipes & fitting are non-conductive and galvanic or electrolytic action does not affect its working. Thus flow rate will be more. Resilient and resistant to most of the chemicals - uPVC SWR pipes & fittings are resistant to alcohol, fats, oil, aromatic & chlorinated hydrocarbons. Also they are more reliable and do not support any fungal growth. Uv Stabilized - uPVC SWR pipes & fittings usable for drainage system is UV Stabilized which eliminates the adverse effect of sunlight and weather. Therefore the system can be used for out door applications. Non- Corrosive - Pipes do not support any for formation of rust on pipes. Durable and long lasting - It has very good tensile and impact strength, hence, site breaking is totally eliminated.